Where do you go in your mind? When you need a moment of peace or comfort or happiness or clarity, what scene does your mind’s eye play for you? Even as adults, our imaginations can help us–if we exercise it. Hold up. Wait a second. I have an announcement to make. A big one. 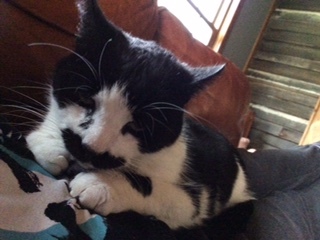 The other day, out of nowhere, the famous and feral mustache cat jumped on my lap! I couldn’t believe it. I know many of you told me it was only a matter of time, but I couldn’t imagine that cat would ever trust humans enough. He didn’t stay long. Just testing it out. Look at his little face, so uncomfortable.